For many centuries, playing cards looked quite different from what they look now. It was not before the second half of the 17th century that the French started producing cards in manufactures by means of printing in response to the growing demand for cards. The green cards (clubs and spades) gradually turned into the black ones because the black colour was more readily available. In addition to that, the French-style pack of cards featured a queen instead of one of the jacks. Mateusz Ozięblowski, the owner of the manor in Gelgaudiškis, had an unpleasant case before him on the 10th of June 1597 that he was about to resolve together with several of his friends. The case involved his servant Jan Šimonovskis who, together with his another servant named Jarosz Stefanowski, played cards for money in the house of Wojciech Romanowski, the resident of the town of Gelgaudiškis two weeks ago while Mateusz Ozięblowski was on a trip. Jarosz was lucky enough to win a Polish złoty from Jan. The latter then tried to persuade Jarosz to play on but he left the house and went to see another resident of the town named Petras Kaklius where he asked for beer. Petras refused to give him beer because Jarosz still owed him money for the beer he had drunk earlier. Jarosz stayed there because he expected Petras would change his mind about the beer. Jan Szymanowski found him there and started persuading to continue playing cards. The two men started quarrelling and exchanging hard words and, losing his temper, Jan eventually clubbed his card companion to death. The murderer tried to abscond after realising what he has just done but was captured just a couple of miles away. The patrimonial court sentenced him to death. The seemingly innocent game using pieces of paper would ignite disputes that sometimes led to serious mishaps. When did potatoes enter Lithuania? The earliest history of the modern playing cards is somewhat mysterious because cards usually carry images of symbols and figures. Scientists have been arguing for more than a century about the origins of cards and the way they gained popularity in Europe. Playing cards first entered Europe in the 14th century at the latest. The earliest historical sources referring to cards are from northern Italy and from the cities in southern Germany. In the Middle Ages, cards were painted by hand, just like manuscripts, which made them unaffordable for many people. Despite that, it was in the Middle Ages that cards presumably became popular among burghers while educated people became familiar with them later. This explains why there are so few documents related to cards from the 14th century. The documents mostly include all kinds of restrictions and chiding against those addicted to cards. As different card games became ever more popular, the 15th century saw the emergence of first professional cards makers and engravers whose products matched works of art. Many aristocrats got obsessed with the card playing but it was not until the beginning of the 17th century that cards became common among peasants. Cards most probably reached Lithuania from Germany through Poland. This notion is supported by the fact that the most widely used packs of cards in Lithuania consisted of 48 units in the 15th century, just like in Germany. Cards often featured images from everyday life, sometimes comic and even vulgar. The first mention of cards in Poland dates back to 1452 in a document issued by the University of Cracow that banned them. The first card makers (kartenmacher, kartenmaler, cartarius, chartarius) are known to have worked in Cracow in the turn of the 16th century. It is around that time that card games became popular among city residents and aristocrats. There is a documented story about Sigismund I the Old, the future Grand Duke of Lithuania, playing cards in the evenings on his way from Silesia to Cracow in 1501. Thomas Murner, a Franciscan monk, used images of cards to illustrate his book Logica memorativa, a compilation of exercises for developing logic and memory, that was released in 1507 in Cracow. It was about that time that cards reached Lithuania and became popular among the nobility. A 1549 letter by Mikalojus Radvila Juodasis (Mikolaj Radzwill "the Black") provides one of the earliest mentions of cards in Lithuania: the nobleman wrote about card addicts seeking to become state officials with contempt. It is very likely that cards from Poland were used in 16th century Lithuania although the first packs most probably reached the country from Germany. Polish and German cards featured different images. Scarce examples of the cards made in Poland usually bear military images and pictures depicting the life of the nobility. German-made cards very often feature scenes from urban and rural life that never appear on cards from Poland. In addition to that, German-made cards usually are more sophisticated in the artistic sense. Lithuanians would sometimes borrow card images or their details to decorate different household items. One such example is a furnace tile found in the Palace of Grand Dukes of Lithuania in Vilnius depicting a comic scene with two rabbits grilling a hunter skewered over the fire. The six of spades from the 16th century pack of cards made by Erhard Schön, a card maker from Nuremberg, carries an identical picture. The evolution of cards: the colours and the emergence of "the queen"
Cards used in the 16th century Lithuania were different from the ones we know now. The meanings of symbols and the hierarchy of cards, however, remained more or less the same over the centuries. The tradition of dividing the image of a card into two parts each of them featuring the same picture and the same symbols first became known in the 19th century England and later spread into other countries. Older cards featured undivided picture-like images. Four suites of cards were common, just like nowadays: bells (diamonds), hearts, acorns (clubs) and leaves (spades). For many years, the card symbols were red (hearts and diamonds) and green (clubs and spades) rather than red and black we are used to now. Until the late 16th century, different card symbols were often used in a number of European countries but the aforementioned four finally proved the most popular of all. 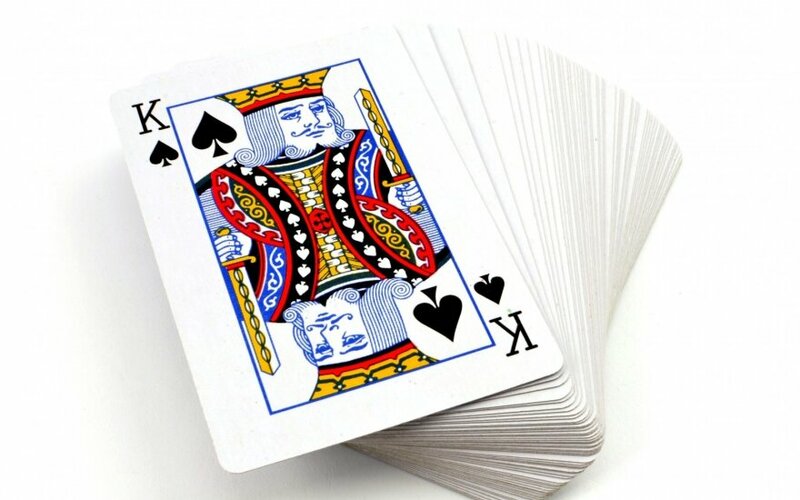 The Polish pack of cards normally included 36 cards, nine of every suit including four aces, four kings, four senior jacks (wyżnik) and four junior jacks (niżnik). The latter two cards were sometimes called knights and squires but the more common name was "highers" and "lowers". Usually it was difficult to make a distinction between kings and the two types of jacks because all of them were male. Kings were depicted wearing crowns or on horseback. The only difference between the "higher" and "lower" jack was the location of the symbol on a card as the "higher" jack had its symbol on upper part of the care and "lower" jack's symbol was on the lower part of the card. The composition of the pack of cards changed in the late 17th century alongside the images painted on cards. The French-style cards and other French games were becoming popular in the Polish and Lithuanian Commonwealth at that time. 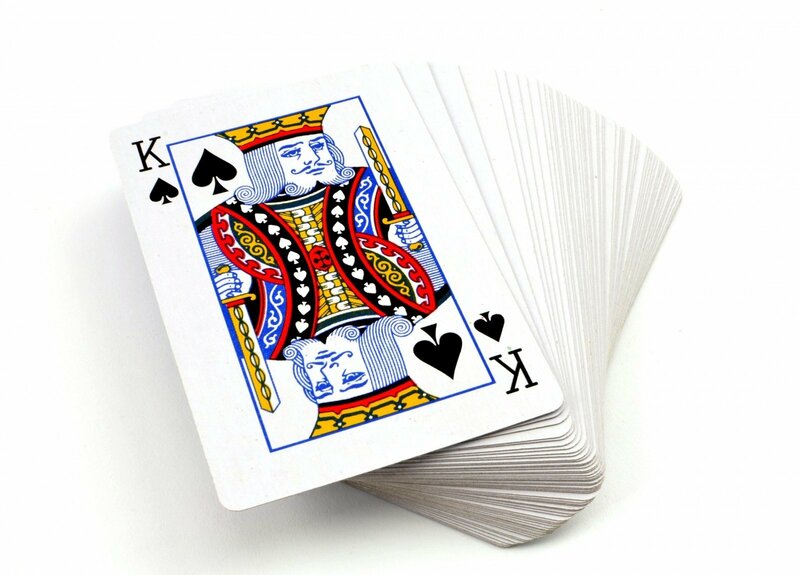 The French-style pack of cards featured a queen instead of one of the jacks. In addition to that, France began producing cards in manufactures by means of printing in the second half of the 17th century in response to the growing demand for cards. Therefore, the green cards (clubs and spades) gradually turned into the black ones because the black colour was more readily available. There are no surviving examples of cards made by the card shop that operated in 1695 in Vilnius or produced at card manufactures near Hrodna in the late 18th century. Despite that, a glance at Polish cards of the period leads to the conclusion that the French innovations had little or no impact on card-making traditions in the Polish Lithuanian Commonwealth as card packs still featured two jacks and no queen while clubs and spades were still green. Many card games from the period between the 15th and the 18th century are known only by their names. The names usually were uniform for the whole of Europe but game rules could differ substantially. This is why we now know the rules of only a few card games from that time. The royal courts dictated the trends for card players from the late 16th century to the late 18th century. Surviving period documents indicate that almost all rulers of the Polish Lithuanian Commonwealth of that time were passionate card players. Picket and Flux were among the oldest card games here, known from the 16th century. Basseta became popular in the 17th century while Pharaoh apparently was the favourite game of Ignotas Masalskis, a bishop of Vilnius known for having constantly wagered large amounts of money.